Click here for February - March 2019 schedule. If you are visiting Antigua for more than a few days and planning a trip into St. John's, you can choose whether to hit St. John's on a cruise ship day when the small harbour town is literally jumping, or if you prefer a more sedate experience you can go on a day when there are fewer or no ships. 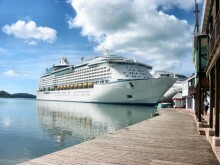 The schedules detail cruise ships arriving in Antigua Ports with details of ports where known. Heritage Quay, Nevis Street Pier and Redcliffe Quay are in St. John's on the North of the Island whereas Falmouth Harbour is in the South. Please note that the calendar is produced four times a year in January, April, July and October and is usually not updated until the beginning of each of those months.